1: Visit our website and click on the LOGIN/BUY CARD button on the top right or simply click here for the direct joining link. 2: In the joining page, you can sign up manually by entering your details or continue with Facebook/Google. 3. 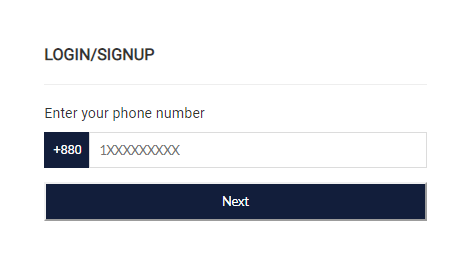 Click on the 'Enter Phone Number'. You will get a 6-digit code on your phone. Enter the code in the next window and continue. And you're done verifying your number! 4: Select the card type that suits your lifestyle best. If in case you choose to buy a card later, click on the Continue without card option. You will become a guest user with limited access to the website only. 5: In the Payment & Details page, you have an option to customize your card, If interested, tick the ‘ I want to customize my card with my name on it.’ This feature to customize your card is available only for the online payment with a charge of BDT 150. Enter a referral code or promo code if you have any. Type in your full delivery address where you would like us to dispatch your card to and then press next. 6: Congratulations! You are now a Royalty Member subject to your payment being completed successfully. Before you receive your card, do login in your account and remember to verify your email. Your card will be delivered to you within 7 to 10 working days. In case you have any queries, feel free to contact us at support@royaltybd.com or call us at 09638620202.